Rio de Janeiro, Carioca Landscapes between the Mountain and the Sea, is a dramatic example how the landscape has been used and shaped. This city of great beauty reaches from the mountains to the sea. Rio’s natural landscape started to be altered in the 17th and 18th centuries to allow sugar and coffee growing. Its parks and gardens later became protected, and as such attributed to the outdoor living culture of the city. 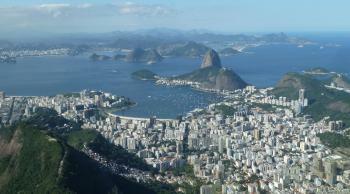 My visit to Rio de Janeiro was a short one, and I was rained out during the first day. The next morning it was more or less dry. By bus I went to the Pão de Açúcar (Sugar Loaf). This is the most prominent hill in the landscape of Rio. You get to the top via two cable cars. There may have been 75 people inside and it was pretty busy. 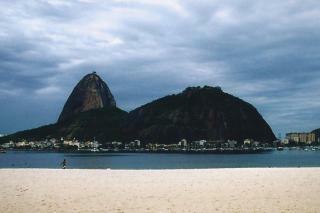 The halfway stop I found the most beautiful: the views of the beaches and the Sugarloaf itself. A day later the sun was shining again. So a quick taxi ride brought me to the Corcovado, the mountain with the well-known Christ statue. It is reached by a little train, a tourist attraction by itself in Rio. What I found striking were the number of people engaged in the train. It looked like an employment project for the local youth. The train ride took about 20 minutes, passing through the Atlantic rainforest of the Tijuca National Park. A beautiful ride. Up near the statue there's a beautiful view over the city. Back at the bottom again I visited the Museum of Naive Art. Definitely worth it, with paintings on Rio and the history of Brazil on show. The issue I have with this site is that it's never really clear when you're actually in a World Heritage area - the designated spots are not distinct enough from the rest of the city. You don't really need to do anything special to see the WHS areas - any normal tourist will go to at least a couple of them. And I don't really see their significance. Still, Rio is a fascinating city and certainly worth visiting. You'll never regret going if you haven't been before! As far as arrivals go, not many places are going to top Rio. Our morning flight from Belo Horrizonte brought us over Rio’s incredible cityscape , nestled in amongst rainforest clad rounded peaks. My wife and I were clamouring over the window for our first glimpse of Christ the Redeemer, the Maracana, and Copacabana beach. Our descent into Santos Dumont airport was completed by a dramatic turn in front of Sugar Loaf Mountain. It was an incredible introduction to a unique city. The world heritage site boundary is actually pretty limited. It excludes the majority of Rio’s built environment, which is covered separately by the four tentative sites that are scattered over a small area in the city centre. As such the outstanding universal value of this cultural landscape lies mainly in its natural features. Given the limited boundary, it wasn't until late on our second day of touring that we entered the core part of the world heritage site. This was when we went for an evening stroll around the pleasant suburb of Urca, which is tucked up against Sugar Loaf Mountain. The seafront wall provided a nice place to join the locals while watching the sunset, the planes circle, and kids play beach football. The unique urban landscape meant there were endless times when the best thing to do was gawp at the magnificent views. The best are from Copacabana Fort, from Niemeyer's Niteroi art centre back across the bay, the brooding monoliths that dominate the beaches of Botafogo and Ipanema, and of course the vista from the base of Christ the Redeemer statue. The latter is one of those places that lives up to its reputation and overexposure in 'must see' lists. Rio turned out to be a welcoming and friendly place, though we never quite found the sort of neighbourhood atmosphere that has made many other large cities we’ve been to so enjoyable. Botafogo and Santa Theresa both seemed pleasant, but we happened to be in these areas on quieter nights and so perhaps not seeing them at their best. 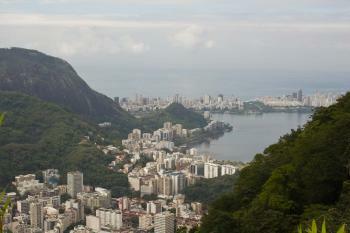 As die-hard urbanites, we felt that Rio as a city left us wanting more. However, the spectacular natural setting and welcoming population make this world famous city an extremely enjoyable place to spend four very full days. Just visited (March 2013). I have some mixed feelings connected with Rio's nomination. First of all it is one of those places that don't need UNESCO status to be visited. There are not many other big cities in the world with so remarkable lanscape / location. Truely one of world wonders. 4.5: Monica Tasciotti Vicente B. Avanzado Jr.
Prison: Fortaleza de Sta Cruz. Used as a prison during the 19th C particularly for political prisoners. 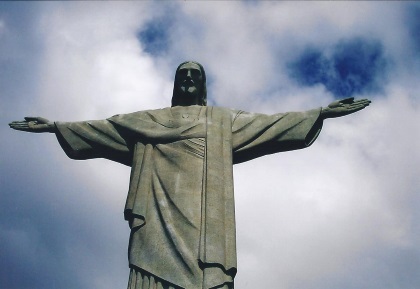 Built or owned by French: Christ the Redeemer: sculpted by French artist Paul Landowsky.